What do a rapper, a returned soldier, a reformed gangster, a grandmother, a petroleum geologist, a bestselling author, and a microchip engineer have in common? They are all wresting control of food from an industrial system responsible for a plague of poor personal and planetary health. 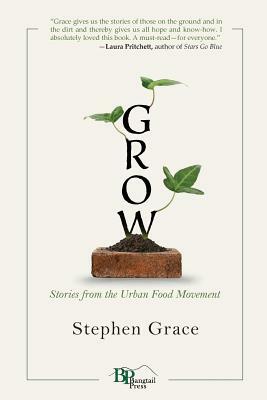 In his landmark work, "Grow: Stories from the Urban Food Movement," Stephen Grace embarks on a journey of discovery to understand what motivates these urbanites working to reinvent the way we feed ourselves. From the driver of a repurposed garbage truck healing the soil to a guerrilla gardener bombing the city with seeds, a cast of extraordinary characters emerges as Grace makes his way into the heart of a revolution. He discovers that food can be a means to tackle some of our most pressing problems, from youth crime to the healthcare crisis, from resource depletion to climate change. Instead of succumbing to despair over global challenges, the citizens of Denver profiled in "Grow" find the creativity and fortitude to begin rebuilding the food system in their own backyard. This shift in the Mile High City is a microcosm of a movement redefining our relationships with farming and food-and with each other. "Grow" is concerned with what we put on our plates, but its true subject is the stories we tell as we struggle to repair our severed connections to nature and our fellow citizens. In the tradition of great travel writing, "Grow" encounters worlds as diverse as permaculture and hip-hop with expansive curiosity and irresistible humor. Whether joining a crop mob or collecting compostable waste in an alley, whether foraging for cactus or seeking refuge in a cafe founded on compassion, Grace illuminates moments of growth as he explores the hardest parts of the city. "Grace gives us the stories of those on the ground and in the dirt and thereby gives us all hope and know-how. I absolutely loved this book. A must-read-for everyone." -Laura Pritchett, author of "Stars Go Blue"
"Grow is gorgeously written and a true pleasure to read. Grace is a lovely writer and here he puts his mastery to the highest purpose-changing the way we live so that we can take care of our planet." -Helen Thorpe, author of "Just Like Us" and "Soldier Girls"
"Stephen Grace has written with passion, wisdom, and-yes-grace about the backstory of the food on our plates, and about the people in Denver who are working to bring that story closer to home..." -Nick Arvin, author of "The Reconstructionist"
"Years from now, people will read this book by Stephen Grace and think, 'That's how we did it That's how people in cities figured out how to feed themselves instead of relying on food trucked in from thousands of miles away '" -Kristin Ohlson, author of "The Soil Will Save Us"